Wikia hosts wikis in over 200 languages(there are 8 types of Chinese languages available), there are over 150,000 sites and over 30,000,000 visitors per month here. This Children’s Books Wiki is an active community, check it out if you are interested. Voicethread – web-based communication network built specifically for K-12 students and eductors, it’s a collaborative, multimedia slide show that holds images, documents, and videos and allows people to navigate slides and leave comments in 5 ways – using voice (with a mic or telephone), text, audio file, or video (via a webcam); you can share a VoiceThread with friends, students, and colleagues for them to record comments too, embed it into other websites, or export it to MP3 players or DVDs. Wiggio.com is a free, online toolkit that makes it easy to work in groups. It lets users form online groups and provides the tools to create private listservs and web addresses; manage events with a shared calendar; send eMail, text, and voice messages; and manage files in a shared folder; host web meeting and chatroom; share computer screens; poll your group in real time. The iphone app is available. Zoho offers a complete range of free online productivity and collaboration applications, including email, word processor, spreadsheets, slide shows, document management folders, wiki, note taker, online organizer, group chats, web conferencing, database, project collaboration, and a repository to share documents with other users. All Zoho applications work together seamlessly. This is an excellent alternative to software based office suites. Students and teachers can create and share documents online easily. google doc includes step-by-step guides for using Google Docs, a set of four documents for student use, and a teachers’ guide with suggested lesson plans. Click the photo below to link to how-to tutorial by GCFLearnFree.org. MixBook is like a digital scrapbook. You can choose theme, background, layouts and creative elements, you can use pictures and clip arts from your computers or from online photo albums : Picasa, Flickr, Smugmug, PhotoBucket or facebook. You can invite your friends to collaborate on the same project, edit and share the books online for FREE! MixBook for Educators is a safe environment for digital storytelling project in classrooms. IDroo – an online educational whiteboard to use with skype to give you the instant collaboration with unlimited participants, there are math typing tools, drawing and writing tools and input images onto the window in different ways, it’s free for non-commercial use. Scriblink is a free digital whiteboard that users can share online in real-time, with in-screen chat, VOIP conferencing, file transfer. typewith.me – this is probably the easiest tool for online real time collaboration ever, click create a new document, send the URL to your students and away you go, you can see the other persons typing in in a different color, this works great for small groups. 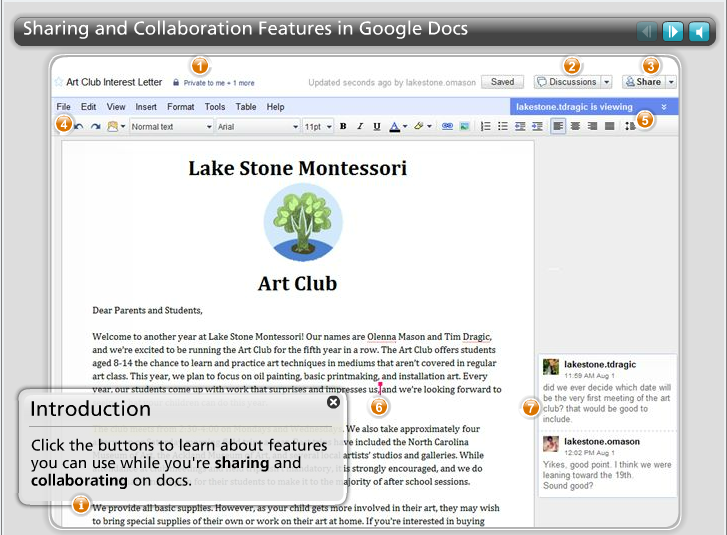 Users can import and export text files, websites, and documents for collaborative learning, brainstorming, and editing. Students can collaborate with one another on projects or group study sessions, and revisions are saved. A time slider function lets users and teachers view the chat progression. JoinMe allows you to share your screen live with up to 250 viewers for free. You can even view the screencast on ipad/iPhone and Android phones. Yeou can even control the viewed computer remotely, a useful feature for fixing any computer problems from afar. You need to download a small file to start sharing. Wall Wisher is a web application that provides a virtual bulletin board for teachers to questions or ideas for students to think about, students are sent the unique wall URL and can leave virtual sticky notes answering the question, it fosters collaboration between students. WeVideo is a new service which let people collaborate on making video online and share through social media, with internet connection, you can access the video on smartphones, tablets or laptops. Hoot.Me is a Facebook application that allows you see what your classmates are working on and collaborate inside of Facebook. Once you join a study session, you can collaborate using group video conferencing and smart chat. Smart chat allows typed math equations to be automatically reformatted to look the way they should. Sessions are stored and video can be recorded, so you can get help from past conversations and receive notifications when your questions are answered. Check the private box before creating your session and invite only the people you want with the invite button or by sharing the private link. You can find tools for real time collaboration/communication through video conferencing here.